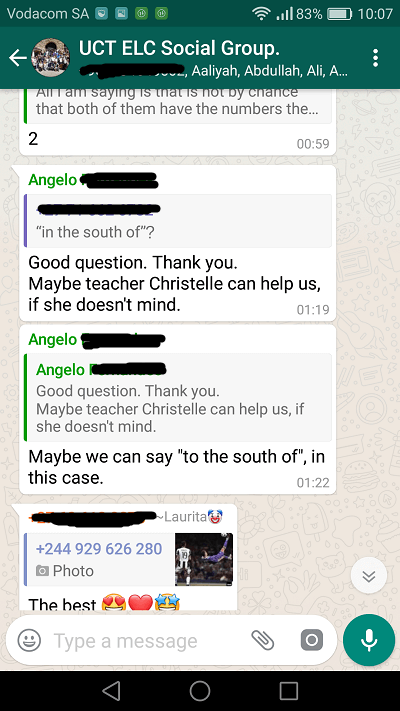 On your first day at the UCT English language Centre, you will be asked if you would like to join the ELC social whatsapp group. It is completely up to every student if they wish to join or not, and students are free to leave at any stage. This group is also purely for students. We do have three admins from the school who will occasionally post important notices and reminders to students about public holidays, for example, or social programme. We also ensure that the group remains strictly English speaking, that no advertising is posted and that a high level of respect is maintained. The group currently comprises 184 people – this is both past and present students. Some students choose to exit the group when they have finished their studies with us, but some have remained a part of the group for years now – occasionally popping up from their own countries to say hello to everyone and send greetings and well wishes to other students and/or teachers. Students also share their photos and videos of meeting up with one another back home in their own countries, or crossing in airports, visiting each other in different countries and always sending warm greetings and happy news to everyone. Just recently we had Marlyse from Gabon, who is currently studying in China, send us greetings from a very cold Ganghzou, and Maira sending beautiful, spring greetings from Switzerland. But, apart from staying in touch and keeping up to date with social programme activities, this is a perfect platform for practicing English. Some students share websites and links to improve your English or get tips. They share English jokes, news items about Cape Town/South Africa, local events, etc. But, the students communicate with each other in English only. It is informal, and admins do not correct and change/advise students on their English. This is a free place to express themselves, at all levels. 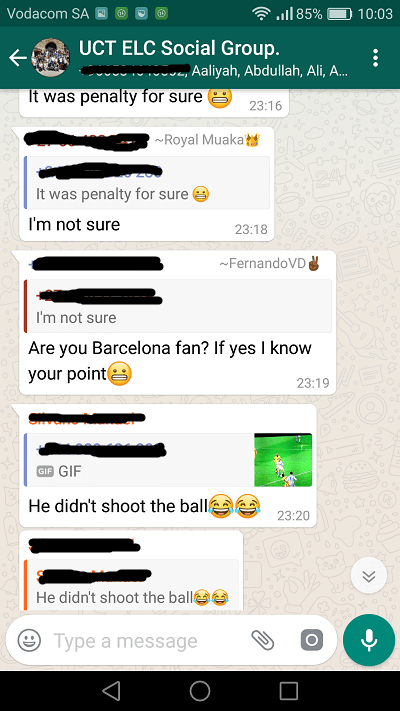 Occasionally, students help each other out and correct each other’s’ English, while other times there are clear questions to admins for assistance. Remember, learning English is not only about sitting in an English classroom or doing exercises in a course book. Learning English is about overcoming any fears you have of making mistakes in a different language and actually using the language as much as possible. 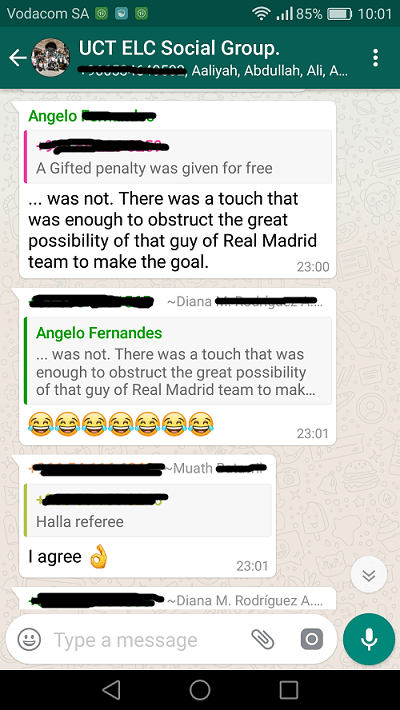 The student whatsapp group has become a safe and non-judgemental platform for students to practice natural English with each other. We look forward to having you join the UCT ELC family and adding your views, laughter, smiley faces, photos and videos to our group! Contact us to find out how you can join.